On 20 September 2017, the Civil Guard and the Spanish National Police arrested 14 senior officials of the Generalitat (the Catalan government) and carried out 40 searches of public buildings and private homes. A police operation then seized propaganda material of the CUP (Candidatura de Unidad Popular, the main party of the pro-independence left) and, without any legal authorisation, surrounded its headquarters for the whole day, for no reason other than provocation. Following the prosecution of more than 700 Catalan mayors who support the referendum on October 1st and after repeated complaints against the Bureau of the Catalan Parliament, these actions represent a qualitative leap in the escalation of repression by the Spanish state institutions against the referendum on self-determination. Spanish police raid government offices in Barcelona. Image by Susana Vera/REUTERS. Further to this the Spanish Ministry of Finance’s decision to take administrative control of the Generalitat’s accounts de facto amounts to the cancellation of autonomy, after long years of control of public finances by the Generalitat. This under the pretext of ensuring the implementation of austerity policies, although in practice the Madrid government has been seeking to progressively drown autonomy. In addition, Minister Montoro’s measure puts many budget items at risk (starting with the basic insertion income recently approved by the Parliament, aimed at alleviating extreme poverty and social exclusion) and generates uncertainty among civil servants and public employees about their next pay packets. Since 6 and 7 September – with the approval of the Referendum Law and the so-called “Disengagement Act” by the Catalan Parliamen – there has been a situation of dual legitimacy in which there are two legal systems that do not mutually recognize each other. The first of these laws is intended to convene the referendum and the second constitutes a kind of “provisional constitution” between a hypothetical Yes victory and a Constituent Assembly. Both laws have been annulled by the Spanish Constitutional Court, but they remain in force from the point of view of the government of the Generalitat and a majority of the Catalan population, who believe that the Constitutional Court has no legitimacy to annul them. This situation contains in embryo a political revolution in a part of the Spanish state and an unprecedented crisis of the post-Francoist monarchy and constitution of 1978. The coming hours and days will be decisive for the outcome. The situation is very tense and the events of 20 September announce an escalation of actions-reactions that points to a situation going beyond the established framework. For the moment, the repressive apparatus has not been fragmented (the Mossos d’Esquadra, the Catalan police, have not dared to disobey the orders of the Spanish courts, but try to adopt a low profile that prevents them from being tried for disobedience), but it is hard to know what will happen if there is open and massive repression against a population that is mobilizing peacefully. At the moment, the Catalan government is maintaining the call for the referendum on 1 October although in previously the Civil Guard also seized electoral propaganda, ballot papers and census letters in printing presses and newspapers throughout Catalonia. The escalating repression of the Spanish state, preceded by the so-called “gag law” (which has already severely curtailed democratic rights to deal with the struggles of the indignados and mareas) has generated a de facto state of emergency in which basic rights are being seriously violated. This not only jeopardizes the future of Catalan institutions but threatens the most serious political regression since the coup attempt of 23 February 1981. 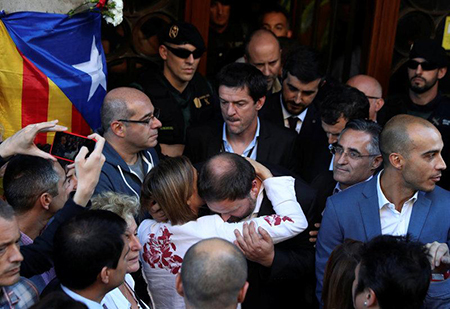 Protests erupted following the repressive actions of the Spanish State. Photo by Albert Gea/REUTERS. 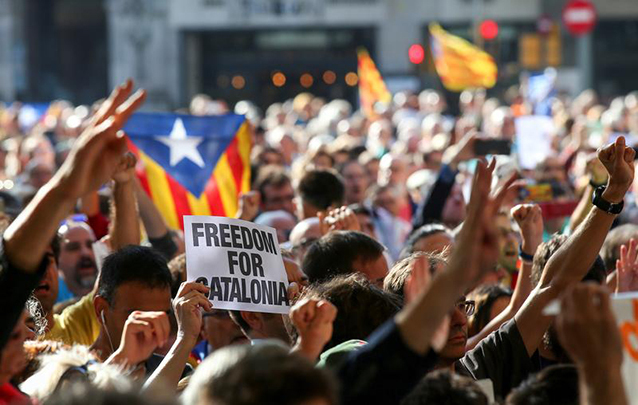 The reaction of the Catalan people, including significant sectors of the organized labour movement, has been an enormous mobilization in Barcelona and throughout Catalonia and has counted on mass solidarity against repression and for the right to decide in the main cities of the whole Spanish state. There are discussions on calling a general strike against the repression and on 20 September the Barcelona dockers decided to sabotage the cruisers moored in the city’s port accommodate the almost 5,000 police and civil guards that the Ministry of the Interior has sent to Catalunya to repress the Referendum. In the coming days, there will be a trial of strength between the Catalan popular and pro-sovereignty forces, with the support of the democratic sectors of the Spanish people, and the immobilism and authoritarian tendencies of the Spanish state, inherited from forty years of Francoist dictatorship. Moreover, it seems that for the first time the conditions exist for a real coming together of the two great mass movements generated by the world crisis and the regime crisis in the Spanish state, that until now have remained distant and suspicious of each other: the indignados movement that exploded on 15 May, 2011 and the Catalan pro-independence process that emerged a year earlier. The anti-capitalist and revolutionary Catalan and Spanish state forces must take advantage of and develop enormous strategic potential for rupture inherent in this. The pressure of events is pushing for an objective convergence: faced with repression, the workers and popular sectors become aware of what is at stake and, in turn, nationalist currents seek solidarity from the progressive and democratic forces of the Spanish state as a whole. In this context, international mobilization plays a fundamental role in the conflict. A victory in Catalonia would be a victory for all the popular, revolutionary and democratic forces of Europe and the world. A defeat will lead to a serious setback for democracy and class struggle in Catalonia, the Spanish state and the European Union. The Fourth International calls on its national organizations to organize solidarity in all countries and to call rallies in front of the Spanish embassies and consulates, forthe right to self-determination and against repression faced with each new repressive action attempted by the Spanish state. Long live the right of self-determination of Catalonia! All our support for the 1 October referendum on self-determination! Down with the repression, the attack on freedoms and political regression! This statement was originally published on International Viewpoint.